So, you’ve seen the light and decided that maybe Hosted Telephony is the right choice for your business but, now you need IP Phones. You’ve looked around but it’s overwhelming, there are phones everywhere! But, before you give up, take a look through our handy tips so you can figure out which model is perfect for your business. What phone system are you using? IP Phones are abundant, but before you sprint off and buy the first model you see it’s important to consider who will be using the phone and how the phone could be used efficiently and effectively by the individual. As it is with all businesses, different individuals are required to perform different tasks, therefore, a manager would need an IP Phone with more functions than their subordinates would. Most IP Phones on the market come with standard features such as call routing, call transfers and HD call quality, but of course, IP Phones on the higher end of the scale come with more features. As mentioned above, different positions need different phones. Higher end phones come with features like voicemail-to-email, fax, cameras, built-in wi-fi, which would be more geared towards company executives and directors. In addition to that, it’s important to consider if the phone you want has headset support. For businesses with employees that take a frequent number of calls in close proximity, it’s important that the phone you purchase is capable of allowing them to use a headset. Wireless headsets are also an option with some phones on the market, this is perfect if you want your employees to have more mobility around the office when taking calls. How many calls will be taken? Knowing how many calls the average worker in your company is taking is helpful in determining how many lines the IP Phone should have. If employees are taking fewer calls, you may want to consider buying IP Phones which may have around 3 lines, however, if the employee frequently uses the phone you may need to consider upping the number of lines. One of the best things about IP Phones is their large price range. This is means that even if your business is a start-up, you are bound to find the IP Phone which is affordable yet capable. So, before you overspend be sure to look around and read the specs on the hardware. Luckily for you, Packnet provides what we believe to be the ‘best in class’ hardware. We have partnered with suppliers who provide equipment of the highest standard, backed up with logistical expertise. 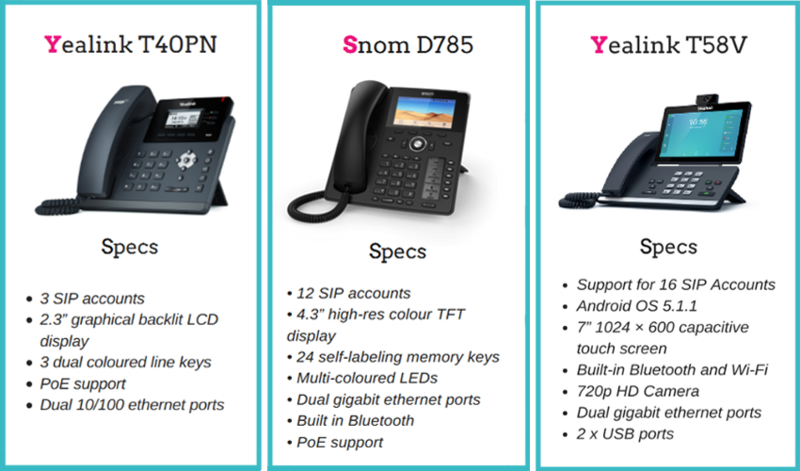 IP Phones come from top industry suppliers, Snom and Yealink. We also offer DECT handsets and base stations from industry leaders Gigaset.